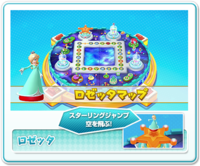 The Rosalina Board is a board that appears in Mario Party 10. It is available exclusively in the amiibo Party mode, where it can be played on when the Rosalina amiibo figure is scanned on the . Like the other amiibo boards, the Rosalina Board is based around a certain character, who in this case happens to be Rosalina. This board is based off of Super Mario Galaxy and its sequel. The board features Lumas, Star Bits, a red Starshroom, and several grassy planetoids. A giant Launch Star-like pedestal sits at the board's top-left quadrant, which allows the player to play a game for extra coins. If a rocket is landed on, the player plays a mini-game where they try to collect the Star Bits in exchange for coins. The board's music is a replica of the Comet Observatory theme. When passing through by area in the top-left corner, the player gets a chance to obtain some coins floating in the space. After jumping on the Launch Star, they need to shake the Wii Remote to charge it up, and then the player will be launched into the skies. The more the Launch Star was charged, the more coins will be collected. But if the player shakes the Wii Remote too much, the process will be ruined and the player won't receive any coins at all. After landing on the Event Space, the player gets a chance to collect some Star Bits by pointing their Wii Remote at them. Each Star Bit is worth 1 coin. This page was last edited on September 5, 2018, at 23:09.